Blue Hors Matine, winner of the Dressage Silver Medal in the Grand Prix Freestyle Class (Kur) at the 2006 World Equestrian Games in Aachen, Germany, has been withdrawn by rider Andreas Helgstrand (Denmark) and will not compete in the dressage competition at the 2007 Rolex FEI World Cup Finals. Because of a minor injury to the horse's near foreleg sustained while unloading her from the van, Helgstrand, the rider of the Danish Warmblood mare, decided that it was in the best interest of the horse to withdraw. 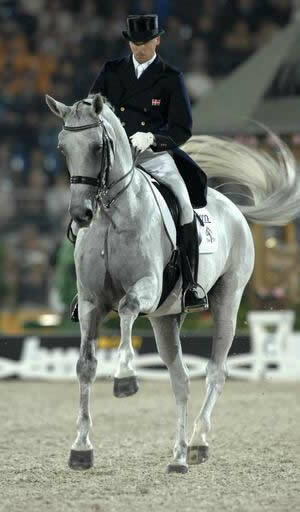 Andreas Helgstrand and Blue Hors Matine during their silver-medal winning Kur performance at the 2006 World Equestrian Games in Aachen. "The veterinarian said that she might recover by tomorrow and be able to compete, but we didn't want to take any chances," said Helgstrand. "It is very sad because I thought we had a chance to do well, but this can be my top horse for a long time and I am not prepared to take any risks with her." The trouble began as the horse reached the ground from her transport to the venue. "The ground was slippery," said Helgstrand. It was then that the horse twisted her front left leg's pastern. After exhibiting some "twisting," an ultrasound was performed and it confirmed the malady. The horse looked good on Monday and Tuesday according to Helgstrand, but in the initial jog, the horse was held for reinspection. "When we trotted the horse, going up she was trotting 100%, and when we trotted her back, she was twisting again," said Helgstrand. "So, there is no chance to compete with her. "When you work with horses, there are ups and downs. This happened at the wrong time of course ... but it's better to keep it down now and let the vets look at her and do what is best for the horse." He said that the prognosis for the mare, according to the veterinarians, was good. Paracco (USA), an entry in the Las Vegas International Dressage competition, was also withdrawn by his rider Jeremy Steinberg. Steinberg cited similar reasons as not wanting to take any chances with his horse as the reason for his decision. Formal competition featuring the world's best jumping and dressage horses and riders begins in a few hours at the Thomas and Mack Center in Las Vegas. The highlight of the afternoon session is the Rolex FEI World Cup Grand Prix Dressage class, and the evening session showcases the showjumping final.